A lot has happened in the motorcycle industry in the last two decades: Big Tire Choppers...Classic Bobbers...return of the Cafe Racer...Stretched Baggers...But it seems the Warbird style Corbin introduced almost 20 years ago was never forgotten. This year Mike Corbin finally caved in to the myriad of requests and has redesigned the Warbird! The Warbird is a series of components designed to work together for a unified look or can be used individually to convert a stock Harley-Davidson FXR into a rolling work of art. Together the components capture the essence of classic Warbirds like the Corsair, Mustang and Thunderbolts for an aggressive stance and smooth aerodynamic line. Warbird Fairing takes its lines from the tank and carries them through the front of the machine. Frame mounted design installs independently of the forks and works with the stock legs or a wider set like we've done here (from VRSC model). Warbird fairing stays straight regardless of the handlebar direction so it always looks tight and aggressive. 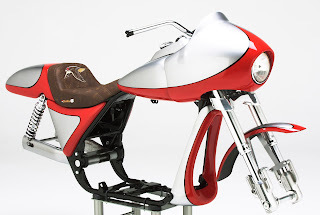 Corbin fairing hides frame tubes and wiring around the triple trees giving a very clean appearance. Chin Spoiler is designed to integrate the lines of the FXR into the bottom end for a more visually streamlined look. Our spoiler flows over the frame downtubes with a large duct built into the design for proper engine cooling. Corbin designed this piece to work with the stock FXR foot controls, but will work with forward controls with a simple modification. Smooth Side Covers provide a very simple and clean look that molds gracefully into the contour of the frame, filling the space and smoothing out the lines. Corbin side covers are available in two styles: FULL covers give a smooth line that fills in the entire "triangle" of the FXR chassis and therefore do not allow for passenger foot pegs. If you are using the Warbird tail section, this is an excellent choice. Corbin's SHORT covers give a very similar look, but allow for passenger foot pegs. Warbird Tail Section is designed to replace the fender and inner fender as a single unit. It gives the bike a fast and clean line at the back that really puts the Warbird look over the top. Includes an integrated license plate frame that is frenched in to keep that clean line. Inside the Warbird Tail is a small hideaway for items like cell phones, summer gloves, GDO remotes and keys. We've even lined the inside to keep these items safe and secure. 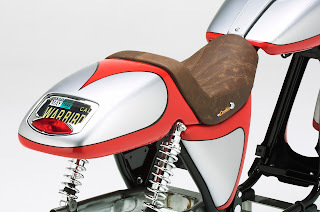 Warbird Saddle is designed specifically for use on the above tail section. Using high density Comfort Cell foam to provide firm support with a very low profile, the Corbin saddle is the perfect finish. Wide, dished seating provides excellent weight distribution so you'll be happy to spend time on your bike. Topped off with genuine leather seating in your choice of colors and styles. Includes custom stitch pattern and Warbird logo embroidery. All Warbird products are ready for your painter to scuff and primer or can be ordered pre-painted in gloss black and ready for installation right out of the box. Mounting is simple and Corbin includes all needed hardware and detailed instructions. 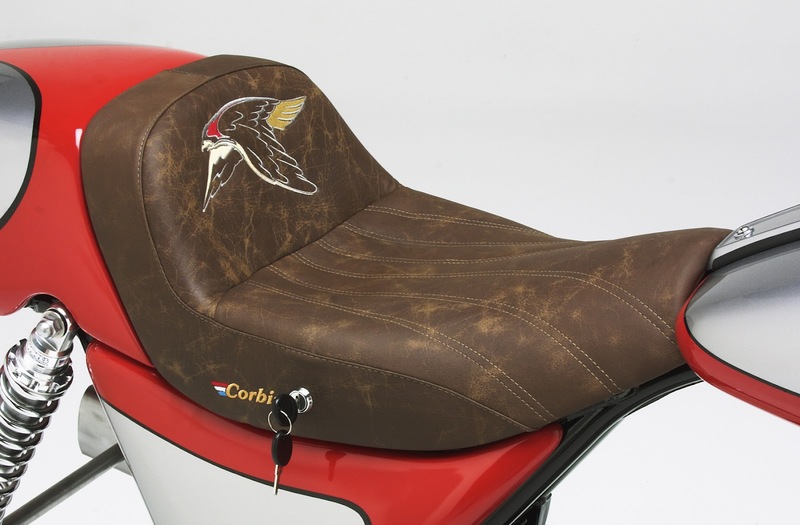 Corbin is the world’s finest motorcycle saddle…Hand crafted in the USA and setting the standard for over four decades! From the original Corbin removable backrest to their unique saddle designs, stylish saddle bags and touring quality fairings; they are unequalled in quality, design and function. Corbin designs and processes are so unique; many of them have been awarded US Patents...a total of 84 Patents to be exact! Visit "The Wizard's Workshop" in Hollister, CA where you can ride in and get a custom saddle made while you wait or their new showroom in Ormond Beach, FL where they're open seven days a week. For those interested in obtaining more information on Corbin, you can reach them at 800-538-7035 or online at www.corbin.com.